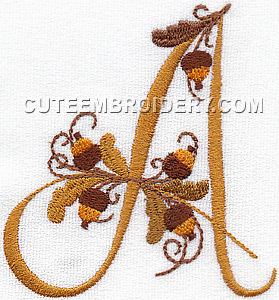 If you have a paid membership to CuteEmbroidery.com you are able free download this design. This font is going to be popular! Etant née en octobre, j'ai une attirance particulière pour cet alphabet ! merci pour tout ce que vous faites ! DO YOU THINK YOU MIGHT FIND IT IN YOUR GENEROUS HEART TO DO THIS AS A FREEBIE NEXT? I love this font! Sure would be nice to have it as the free font! We have this cute one for the children, now we need a classy one for the adults! I really like the Autumn font, can we PLEASE have it as a freebie? Thanks for the Pansies font.